Four individuals were honored with “Trailblazer” awards by the DO-IT (Disabilities, Opportunities, Internetworking, and Technology) Center for the work they do to change how the world views people with disabilities and to increase the potential of people with disabilities to succeed in college, careers, and community life. 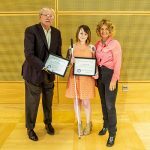 The Trailblazer award winners were Shiri Azenkot (Cornell Tech, Cornell University), Courtney Cole (DO-IT ambassador and 2013 Scholar), Shaun Kane (University of Colorado Boulder) and John Kemp (American Association of People with Disabilities). Read more about the winners.